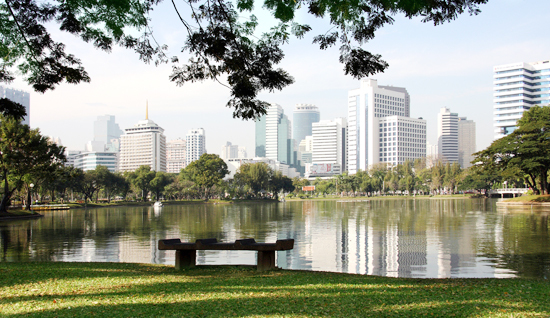 My favorite spot in Bangkok is a shady area by the pond in Lumpini park where I can just listen to the birds and enjoy the wind breeze. 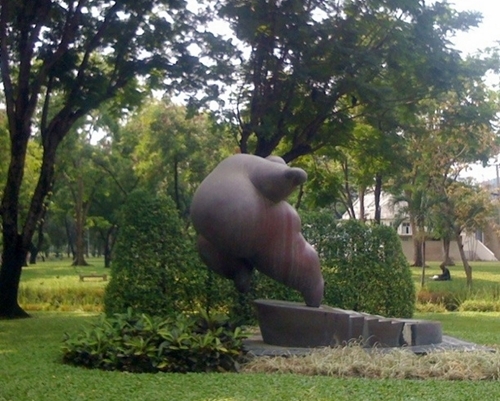 Lumpini park (สวนลุมพินี) or the park that Thai people usually call ‘suan lum’ (สวนลุม) situated on Rama VI road. It is the first public park in Thailand, firstly built in the era of King Rama VI (year 1925), there is his statue in front of the main gate. He gave the name to the park “Lumpini” which is the name of the district where the Lord Buddha was born in Nepal. He passed away before it was completed so the project was frozen for a while until the King Rama VII continued to complete it. 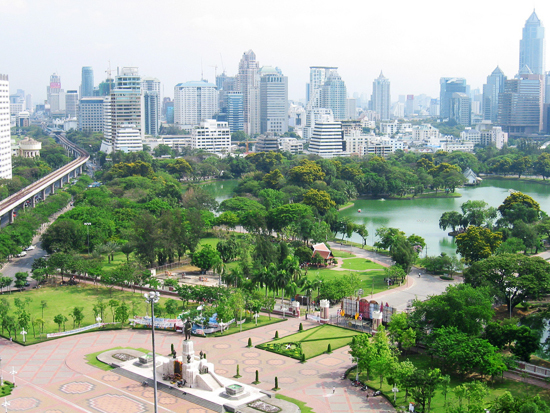 Lumpini park is also the largest park in Thailand, it has an area of 360 Rai or approximately 60 hectres. If you run along the outer track of the park, it is about 2.5 kilometers. – Home of Hope (ศูนย์สร้างโอกาสเด็กสวนลุมพินี) offering consulting services and help to homeless children. Open 10:00 am – 7:00 pm daily. – BMA Apprentice School (ศูนย์ฝึกอาชีพกรุงเทพมหานคร) offering job training in various field for people i.e. computer, tailoring, cooking, hair dressing. – Public library (ห้องสมุดประชาชนสวนลุมพินี) open 8:00 am – 8:00 pm on Tuesday – Sunday. – Tawan Yim ground (ลานตะวันยิ้ม) is the ground built specifically for disabled for recreation. There are special play ground, disabled parking space and other facilities. – Dhama in the park : There are preachment by monks every last Sunday of each month. – Music in the park : There are live Thai and international concerts held every Sunday during February – April in the palm garden from 4:30 – 8:00 pm. I went to see Bangkok Symphony Orchestra concert here first time last year, and it was pleasant to see other families or friends picnicking and chilling out in the park rather than being the shopping mall. ํYou will also find groups of people doing traditional Chinese exercise, Taiji in the morning, and aerobic dancing in the evening. If you are interested to join, it is free of charge. You can also rent a mat for 30 Bath all day! This park is my favorite park in Bangkok although it is quite far from where I live (actually it is only three stations away from Sukhumvit MRT station, but I have two other parks in the walking distance). Whenever I have a chance I will come to spend a day here, running, picnicking, or just lying down by the big pond under the shade of big trees , enjoy the wind breeze and watching birds (There are more than 30 types of birds here). I like this sculpture found in the park – “women in the next three decades”. I highly recommend you to visit this park in case you want to take a break from shopping, clubbing or visiting touristy sites in Bangkok. Don’t forget the Dragons of Lumpini! Monitor lizards wander the park. While i was assign to work in Bangkok, I stay in Natural Ville on Luang Suan soi 2, i visit this park so often. Love everything about it, the people, the atmosphere, or just to get a way from work. an amazing place for the exercisers – hundreds of people running, walking, aerobics, gym, Tai Chi, sword fighting, fan fighting, ballroom dancing, yoga, hula hooping, cycling… Fun jus to watch the passing parade. Very nice article, Mod. Very informative. Keep the videos coming. 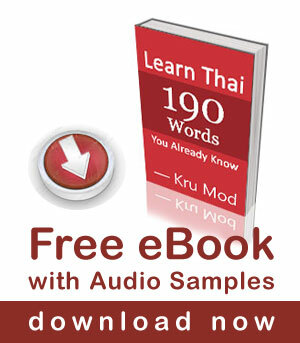 I love learning Thai with Mod. I am a 53-year-old American living on Koh Samui. If you would like to see many delicious photos of Samui, check out my photo blog: http://grouperism2.blogspot.com. With a handshake, Mark C.